A one-sided affair where the BLRC just could not get things together. The Brits forwards were credited by the BLRC coaches as the difference makers, combining strong traditional play and great support lines which allowed for offloads to the support runners and created overlaps out wide. For the BLRC, Barry Bonell had a strong game in the centres and scored the BLRC’s lone try which Tomas Sadler-Rucht converted. The BLRC finish the season with one game unable to be made up. I’m not sure how that, combined with the last weekend of the regular season will affect the final standings going into the playoffs, but they currently sit in fourth place. Not a bad season for the team so far. The 2nd lopsided loss to Seattle in as many weeks for the BLRC Women. Seattle were just too strong, and the Burnaby Lake Women lacked the depth to keep up for all 80 minutes. They finish the season on the road this week at UBC vs the Vancouver Thunderbirds. The two teams are at the bottom of the standings and the winner will avoid the basement designation for the summer. A hard-hitting game that was extremely competitive despite the score line. The first 40 minutes were very back and forth and ended 21-7 in the BLRC’s favour. The difference in score would be attributed to the BLRC’s ability to “finish” a little bit better. The BLRC got try’s in the first half from Giuseppe Laudisio, Brian Murphy and Nolan Shelley. Shelley converted all 3. The Lomas answered through their forwards who pushed in a maul from a 5m lineout. The BLRC started to throw their weight around in the 2nd half and ran in 5 more try’s. The forwards were winning ground in the trenches and the backs had plenty of room to move. Dan Josok and Lynden Duggan each scored nice try’s while Nolan Shelley scored his 2nd and Jean Koorsten cured a first half case of fumble-it is to run in 2 try’s. Shelley added 2 more conversions to lead all scorers with 20 points. The Lomas did score one in the 2nd half with a centre finding a seam in the defence at the 10m line and running in untouched. The BLRC got great performances from a few forwards, most notable was flanker Mathew Chan who was all over the field and involved in every scoring opportunity. Dom Baptista and Jeke Gotegote split time at #8 and they both had outstanding games. The front rowers, Liem Jung, Chris Dunne, Anthony Luca, Cam Young and Andrew Lackner were as solid in the sets as you can get and got involved when they could around the pitch. The backs scored all the points and their hair looked great doing it. The win was notable as well as it clinched the Palmer Cup for Burnaby Lake for the 9th consecutive season. The Palmer Cup is contested annually by the clubs. In the spirit of club rugby, it is awarded to whichever club wins the most head to head club games each year. The Lomas won the cup every year in it’s first 10 years of existence. The Premier Reserves finish the season in first place and now have a few weeks off before hosting a semi-final later this month. The BLRC got off to what has been an all too common slow start. Unable to string a few passes together and habitually offside. A bright note for the first half could be that they defended for the better part of 30 minutes and only allowed 1 try. The try came at the 17-minute mark and was scored by Meraloma #7 Connor McCann. The Lomas had a lineout at the 5m and did a great bit of mauling, breaking off twice to form new mauls before McCann was able to dive over for the try. Fullback Jayden Tegg added the extras to give the Meralomas the lead. BLRC veteran Sean McKeown responded in short order after Neil MacLaine booted a grubber behind the Loma defence and over the try line. Sean pounced on the ball for 5 points. The half ended 7-5 in favour of the home team. The 2nd half was a different story and the BLRC came out firing and score 4 unanswered try’s. The BLRC scored their first only a minute into the 2nd half. With the strong wind and rain in the BLRC’s favour, the message was to use the boot to pin the Lomas in their own 22m. MacLaine popped up a high ball and the twisting flight pattern caught the Loma receiver in the face, bouncing into the hands of Gino Paolella. Gino was brought down short of the goal line but 2 phases later Reid Watkins strolled between the posts for a try. Neil MacLaine made the conversion to give the BLRC a 12-7 lead. 10 minutes later with a Meraloma scrum at their own 5m, their 8-man Josh Clarke took it himself from the back of the scrum but ran straight into 2 BLRC back-rowers and a 2nd row who grabbed him from behind. The ball was knocked loose and BLRC captain Mike O’Toole ended up with it, falling over the line for a try. MacLaine, once again, split the uprights and the BLRC led 19-7. With approximately 15 minutes to play Reid Watkins scored his 2nd of the game, taking a short pass from Darren McCrory and zig zagging through traffic for a try. The BLRC scrum, which had a dominant day, were rewarded for their hard work late in the game with a penalty try. 31-7 was your final. Some good games on both sides. Josh Clarke and Thomas Viljoen stood out for the Lomas. Both put in the hard yards and were responsible for most of the Loma offence. On the BLRC side, the halfback duo, Neil MacLaine and Reid Watkins looked good in the 2nd half but my M.O.M. goes to centre Sean McKeown who was stellar in defence and dangerous on attack. In the forwards, Mike O’Toole gets the nod but the entire tight five should be mentioned led by Nik Hildebrand and Craig McLaughlin. The BLRC finish the regular season in top spot, though with too many close calls to count and a disturbing tendency to lose big to the Ravens. They will have a few weeks off to get their house in order and fine tune a few things. 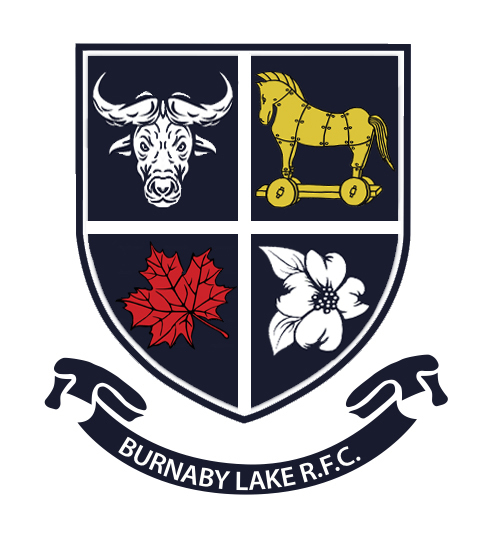 Semi final at Burnaby Lake on April 27th. Big thanks to the referees on the day and to the Lomas, Brit-Lions and Saracens for the great post-games.